The Opportunity rover will celebrate 5000 sols (days on Mars); that is, 5000 Mars days since it landed on the red planet. Opportunity has now been operating on Mars since January 2004 (14 years). During that time it has driven more than a marathon distance (26 miles) across the Martian surface and made a remarkable number of first-time discoveries. Recently it has traveled several miles along the rim of a large impact crater that is the same size as New Mexico's Valles Caldera volcanic crater, giving our first close-up look at a large Martian impact crater. Right now there is a direct connection to New Mexico as Opportunity is driving down a valley that cuts the inside of that crater wall. The science team has selected place names along El Camino Real de Tierra Adentro and these names are being used for landscape features and investigation targets studied by the rover as it moves down the valley toward the floor of the crater. 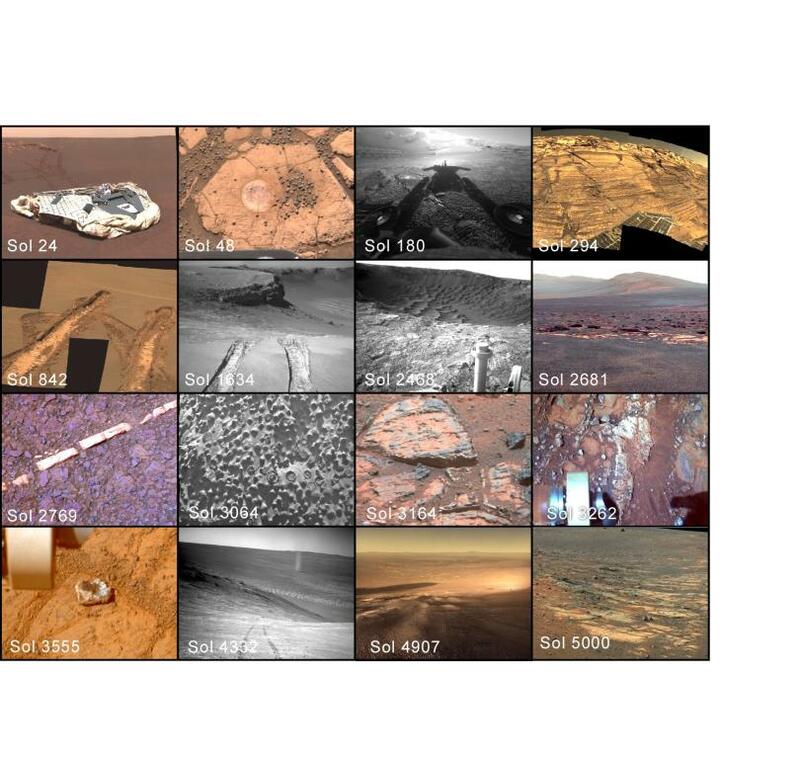 Recent feature names on Mars have included Mesilla, Robledo, Doña Ana, Jornada del Muerto, Socorro, Albuquerque, Corrales, Bernallilo, La Bajada, Santa Fe, and Taos. The New Mexico Museum of Natural History & Science has a direct link to the rover through one of the Museum’s research curators who has been a science team member on the rover mission since it began. The NMMNHS is one of only two museums nationwide with such a link, and the other is the Smithsonian Air & Space Museum. Dr. Larry Crumpler serves as Long Term Planning Lead for the mission and he will be leading the rover plan uplink to Mars on the 5000th day from his office in the Museum. To celebrate this amazing anniversary, the Museum will host Opportunity5000 on Thursday, February 15. Mars information, images, videos, games, and activities for the whole family will be available at the Museum.